As experiments go, 7th House Theater’s presentation of Eugene Ionesco’s Rhinoceros is a pretty successful one. 7th House wanted to get Ionesco’s anti-fascism absurdist comedy/drama up in front of audiences on the night of the inaugural for new President Donald Trump (though I can’t imagine why, can you? ), so they made it happen. Barebones production values by designers Amber Brown and Paul Bigot, just 10 days of rehearsal with director Lauren Keating, scripts in hand and off they go. The cast is so good (and has clearly memorized so much of the text) that the scripts quickly fall away from your conscious vision. There’s a person on the sidelines with a script to call out a line if someone gets lost or off track but I only saw that happen once and the actors didn’t even break stride, they just kept moving on with the scene. Rhinoceros feels like a full production, even though some of the seams are showing, and that’s a deliberate part of its charm. The evocation of the rhinoceroses (rhinoceri?) who invade the world of the play is quite clever. There are musicians posted at the corners of the house surrounding the audience, and a gathering of various noise-making devices around the edges behind the crowd. Singing, music (composed by Kendall Anne Thompson) and noise combine with human bodies thundering around the periphery of the audience to give the feeling of a large noisy animal (or several) thundering by. Musical cues and building noise in the background herald the coming transformations or invasions and help ratchet up the tension for the audience watching, particularly since most of the time the rhinoceros is heard and felt but never seen. I went in not having read the script recently, ready to let the story hit me however it would, and I have to say I came away a little perplexed. 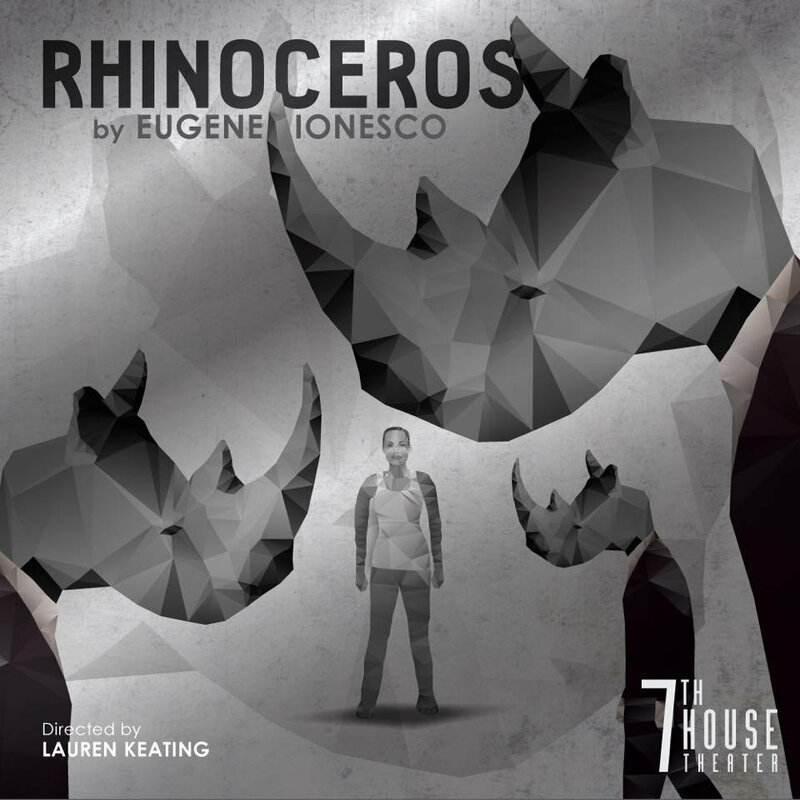 Rhinoceros is supposed to be a simple, if absurd, allegory (at the time it was written, to understand the rise of fascism and the Nazis in Europe, the better to never let it happen again). People turning into rhinoceroses was a way of symbolizing people falling under the sway of fascist ideology - losing their humanity, and any care for their fellow humans, becoming part of a large and destructive force crashing through society and undoing its norms. I did some reading afterward, which always has the potential to be dangerous, but I think the thing that really threw my brain out of whack was the remnants of the outside world that I brought into the space with me when I sat down to see the show. Ironically, the situation outside that prompted the play inside in the first place. Watching coverage of President Trump’s inaugural day colored the way I viewed the central character in the play. Because the rhinoceroses are supposed to be the bad guys here. I’m supposed to be siding with the humans, not the monsters they become. Berenger (Ashley Rose Montondo) is ultimately supposed to be our hero. The one human resisting transformation. But I don’t like the guy, er gal. Pardon the gender vacillation there, but one of the many great things about the production is they take the male role of Berenger and give it to an actress. Nobody in the world of the play blinks. Is this a woman playing a man (which was where I came down most of the time while watching), or a lesbian on the butch side? Doesn’t matter. Daisy (Cat Brindisi) is Berenger’s love interest either way. Everyone treats that as a non-issue, which I understand, given that the larger concern at hand is that all the humans in society are slowly turning into rhinos, and wreaking havoc as a rhinoceros set loose in typically human surroundings will do. The stumbling block is that as an audience member I see the bad behavior of the human beings right in front of me, but I only sense, don’t see the destructive work of the rhinoceros. And many characters in the play speak longingly of the beauty and freedom of the rhinoceros. And let’s face it, the rhinoceros is a dangerous but noble beast. If I had to turn into an animal, I could do worse than a rhinoceros. (Make it clear that the rhinoceros means I’d be a Nazi and then I’ll have another opinion, of course.) But right in front of me I see a guy so bored with his job he’s become an alcoholic who is perpetually late to meetings with friends. I see a guy who shoves a woman (in the script it indicates he slaps her) - either version accomplishes the same thing: I’m kind of done with the guy and don’t blame the woman for walking out. Also, there are some eery stretches, particularly in the second half when Berenger and Daisy are alone together, when I wondered, “Would this be how Donald and Melania spoke to one another if they were in the bunker together, hiding from an outside world they no longer considered safe?” Suddenly the fascist isn’t an animal presence outside the scene, but a human being inside the scene. And at times that human being is almost sympathetic. What am I supposed to do with that kind of cognitive dissonance? (Not that cognitive dissonance is a bad thing.) Berenger is dressed in orange, doesn’t really want to do their job, and has people say things about them like, “You can only predict things after they’ve happened.” Can you blame me for getting a Trump vibe? But I'm honestly not sure if that’s what 7th House is aiming for here. Their intent seems to be to present Ionesco’s allegory of fascism in which the humans are the good guys, and the humans that morph into rhinos are the bad guys. But it’s all just a little fuzzy, for the reasons stated above. The final image, of Berenger railing “I will not capitulate!” while being confronted by a rhino, who then removes its horn also confused me. I couldn’t be sure if it was a prelude to Berenger recovering a human from the rhinoceros side, or Berenger was about to be co-opted into being a rhinoceros as well.